The first thing you notice when picking up a copy of Rethinking Interdisciplinarity Across the Social and Neurosciences is the almost waxy feel of the cover. I do not have another volume from Palgrave’s Pivot series to hand as I write, so I do not know whether this is particular to this book or not. In any case, as an environmental scientist and anthropologist, the haptics of “rethinking interdisciplinarity” immediately take me back to field notebooks: handy size so it fits into pockets, sturdy cover so you can stuff it into a backpack or box of equipment, and, most importantly of all, water-repellent so you may take notes out in the rain. And a field notebook is what geographer Felicity Callard and sociologist Des Fitzgerald have written in at least two senses of the word. First, it is a report back from the field. The two have spent many years in the ‘interdisciplinary’ field of social cognitive neuroscience and they share with us their impressions. Second, it is a field notebook that you may take to your own interdisciplinary field, so in moments when you have become thoroughly disoriented, disheartened and generally fed up with academic knowledge production, you may take some solace from this little helper. While the book does contain some ready-to-use bullets for the hurried reader in the form of short notes and queries sections, my distinct impression is that solace will not be given to those trying to use the book like a conversion table from imperial to metric. This is where the field notebook metaphor ends. The questions, problems and trajectories arising from the practices of ‘experimental entanglement’ are far too varied, ambivalent and situated to be reduced to a best practice guide to interdisciplinarity. Callard and Fitzgerald are very much aware of that and so the small volume—what in German some call a “Zwischenmonographie”, i.e. an in-between or, ironically, an inter-monograph—is more of a starting than an end point. The book is beautifully written. The vignettes from the field are vivid and offer rich insights into the ups and downs of co-laborative fieldwork in the neurosciences. The analyses are thought-provoking, always (self-)reflexive, committed but never trivial, and always with a great sense of irony always prepared to acknowledge the comical if not hilarity in some of the occurrences without ever losing track of the serious matters of concern or respect for their co-laborators. Callard and Fitzgerald report on their own work within different formats of interdisciplinary neuroscientific research. They limit the scope to what is perhaps best described as the emerging and rapidly changing field of social cognitive neuroscience or cognitive social neuroscience or, in rare moments, neurosocial cognition or cognitive science. Yet their case is certainly one that holds true for most interdisciplinary endeavours between interpretative social sciences, humanities and life sciences. The book sets out to deliver an honest account of ‘what goes into and what goes on in’ experimental entanglements within the neurosciences and it is successful in delivering that. It spells out many of the quotidian practices of co-labouring: how to start and get the money, how to find your own position, how to conduct yourself and experiments with whom and why and how to come clean. It is not interested in defining, systematising or even canonising forms of interdisciplinarity. And it does not engage in extensive genealogical or conceptual work. Yet neither is it simply telling tales. It offers reflections, conceptual trajectories and it contextualises impressions from the field. I found this very good to think with in many ways. The book is structured into a more pragmatic first and a more conceptual second half, the authors tell us. Whether one shares this impression or not, the book is very accessible through abstracts and summaries. Seven chapters deal with different aspects of experimental entanglements discussing modes of co-labouring, particular topics and experiences (in particular: ‘the social’ [Fitzgerald] and ‘the resting state’ [Callard] in the neurosciences), and overarching topics of power and emotions. Rather than going through the chapters individually and repeating what Callard and Fitzgerald have already done so well, I would like to focus on a few select points that I found particularly enticing. The notion of ‘experimental entanglement’ works well in that it emphasises how a group of people is called together in an often carefully choreographed socio-technical environment—and how that choreography becomes mangled in practice in surprisingly productive or extremely boring ways. Callard and Fitzgerald emphasise the importance of social interaction, of emotion, of serendipity and of staying with uncomfortableness rather than immediately trying to resolve it into an epistemic or even intellectual gain. Yet they never dismiss the importance of good ideas, of disciplinary training, of hard work and of thorough analysis. What they do dismiss without further ado is the myth of science as the orderly and rational production of objective knowledge and with it forms of science communication and bioethics built on that myth. This is refreshing. The messier understanding of ‘laboratory’ that is implied in experimental entanglement is helpful. It draws heavily on Haraway and others at the intersection of science and technology studies and feminist critique and understands lab practices as the material-discursive production, reflection and diffraction of phenomena. This draws heavily on constructivism, but it acknowledges that the world kicks back (Barad). In this sense, experimental entanglement loses all its associations with the ‘inter-’ of separate disciplinary entities, knowledge as an a-cultural object and science as rational practice. Why this is not reflected in the title of the book is not entirely clear. It could have said on the tin exactly what it does, but perhaps marketing got in the way of that. Callard and Fitzgerald suggest turning the process of experimental entanglement into an object of research itself. To my mind, this is one of the key points of the book. Importantly, this is not about self-reflexivity for the sake of it or for purposes of (re)claiming an identity and rights to go with it. It is not territorial in any simple sense. It is about dealing with being entangled and coming out of it producing knowledge that others may continue to invent around, rather than reproducing knowledge like itself. The point is well made in the book. Yet the authors also run into difficult waters as the proof of the pudding, as they say, is in the eating, i.e. in demonstrating how becoming entangled experimentally produces interesting knowledge. Callard and Fitzgerald try to stay true to the conceptual, empirical and methodical gains derived from their work, but the strong focus on ‘interdisciplinarity’ structurally means that the reader is referred to published articles for some of the hard conceptual discussions to be had in the social neurosciences. As someone who knows the field reasonably well, I do not mind too much. Yet I can see people from other fields feeling a little left out from the details of the conceptual gains. This is, of course, a strategic decision. I am just commenting that separating matter from form has its consequences. An option may have been to include ‘co-curating concepts’ (Rabinow 2008) as a fourth mode of entanglement besides co-authoring, co-experimentation and co-organization. While this is implicitly contained in the three practices discussed, I feel it might have deserved more attention. Strongly related to this discussion of curating concepts, Callard and Fitzgerald raise questions about the practice of being reflexive. The automated diary room à la Big Brother to track and reflect process and progress is in my mind a starting point for a much broader discussion about different modes of ‘reflexing’ as a collective, epistemic, non-teleological and temporary form of research (cf. Boyer 2015, Niewöhner forthcoming). Much of the interpretative tradition in the social and cultural sciences has been set on intellectual practice as centred on the individual (genius). We can learn from science and technology studies and indeed from the neurosciences how scientific practice and indeed reflexivity can gain from acknowledging and practicing knowledge as a social and socio-technical practice. To what extent this then is experimental entanglement or simply good ‘normal science’ is a discussion that Callard and Fitzgerald touch on and that we should continue. Attending to the spaces and rhythms of experimental entanglement is another carefully crafted point in the book and again: it is not important that one shares Callard and Fitzgerald’s categories of matrices, topologies, incorporations and laboratories, though a lot is to be said for them. It is the twist in thinking that makes entanglement an object of topological inquiry that is important. How do I learn to be affected within particular physical spaces and choreographies? And almost in passing, Callard and Fitzgerald quote Paul Harrison to remind us that we must not forget to attend to the non-related and perhaps non-relatable in a scientific world full of interdisciplinary connections. And this is not (only) the subaltern or marginalised. A closing remark about power and critique: I believe that Callard and Fitzgerald are right to alert us to the naiveties with respect to symmetries in co-laboration, the wonders of frank and open language, and understandings of social exchange and scientific practice in some kind of a-social vacuum. I myself certainly felt found out remembering the many times that I have portrayed entanglements as harmonious choreographies just to counteract what I perceived as the dominant deconstructivist atmosphere in the room. It is obvious that powerful asymmetries exist between disciplines, between abilities to shape discourses, between resources, etc. These are (also) structural and they need to be kept transparent as constant contributors to knowledge production. Callard and Fitzgerald are right in demanding that a Weberian and Foucauldian tradition be kept alive within entanglements. Their response to the often-voiced concern that experimental entanglements evacuate critical spaces, however, I find unnecessarily defensive. The particular poverty of dialectics from a critical distance has been analysed by many (e.g. Latour). So I fully understand if people are not interested in becoming entangled. Yet anything but acknowledging these two different modes of critique as complementary or simply doing different things seems territorial behaviour in its least interesting form. Perhaps I have given this too much space here again—the book deals with it, but not in extenso, so perhaps best we leave it at that and get on with it. On a more interesting note, Callard and Fitzgerald suggest subjugation as a positive and perhaps playful form of dealing with inevitable (power) asymmetries that might come after reciprocity. Not to put too fine a point on it, but it seems that what they are after may well be contained within a broader understanding of reciprocity. After reciprocity—read as ‘After Nature’ by Marilyn Strathern (1992) —thus may carry the dual meaning of entanglement moving beyond reciprocity understood in the sense of a mechanistic, symmetrical and direct quid pro quo. Yet taking a broader view of how complex practices of (gift) exchange always operate on and in social order, one may note that subjugation is experimental entanglement modelled after reciprocity understood in Marshal Sahlins’ way of generalized reciprocity, i.e. a true gift that carries a vagueness about the obligation to reciprocate (Sahlins 1972). This might also open up another notion of power after Foucault that traces questions of care and legitimacy through ecologies of practice. This, however, is certainly more than a field notebook can take. Boyer, D. (2015). Reflexivity Reloaded. From Anthropology of Intellectuals to Critique of Method to Studying Sideways. Anthropology Now and Next, Berghahn Books: 91-110. Latour, B. (2004). “Why Has Critique Run out of Steam? From Matters of Fact to Matters of Concern.” Critical Inquiry 30(2): 225-248. Niewöhner, J. (forthcoming in 2016). Co-laborative anthropology: crafting reflexivities experimentally. Analysis and Interpretation. J. Jouhki and T. Steel. Helsinki, Ethnos. Rabinow, P., G. E. Marcus, J. D. Faubion and T. Rees, Eds. (2008). Designs for an anthropology of the contemporary. Durham & London, Duke University Press. Sahlins, M. D. (1972). Stone age economics. Chicago, Aldine-Atherton. Strathern, M. (1992). After Nature: English Kinship in the Late-twentieth Century. Cambridge, Cambridge University Press. Jörg Niewöhner is associate professor of urban anthropology at the Institute of European Ethnology, Humboldt-Universität zu Berlin. He is a member of the Laboratory: Social Anthropology of Science & Technology as well as deputy director of the Integrative Research Institute THESys (Transformation of Human-Environment Systems). His research has entangled him in molecular biology (epigenetics), the social neurosciences and psychiatry, among other fields. Niewöhner J. Felicity Callard and Des Fitzgerald’s “Rethinking Interdisciplinarity Across the Social and Neurosciences”. Somatosphere. 2016. 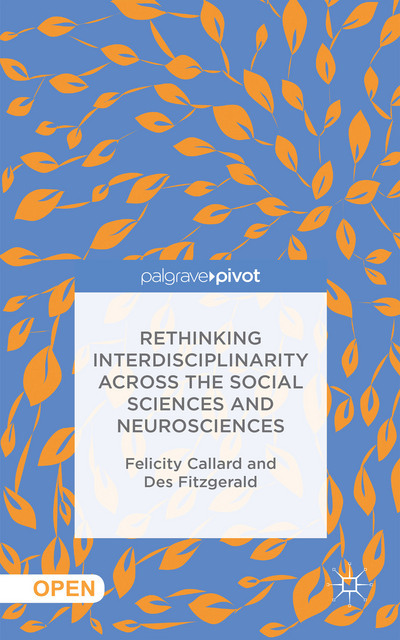 Available at: http://somatosphere.net/2016/felicity-callard-and-des-fitzgeralds-rethinking-interdisciplinarity-across-the-social-and-neurosciences.html/. Accessed April 20, 2019. Niewöhner, Jörg. 2016. Felicity Callard and Des Fitzgerald’s “Rethinking Interdisciplinarity Across the Social and Neurosciences”. Somatosphere. http://somatosphere.net/2016/felicity-callard-and-des-fitzgeralds-rethinking-interdisciplinarity-across-the-social-and-neurosciences.html/ (accessed April 20, 2019).